It’s the age old story… you have worked hard on your stretching, you feel that you are finally getting somewhere, when suddenly you feel that pull, that tearing sensation, that pain right up high near your sit bone. Catastrophe! All that hard work and now you can’t get your leg above 90 degrees! Then just as it starts to get better, you test it out with a battement in class and there it goes again. You will be hard pressed to find a dancer who has not experienced this at some stage in their training or career. 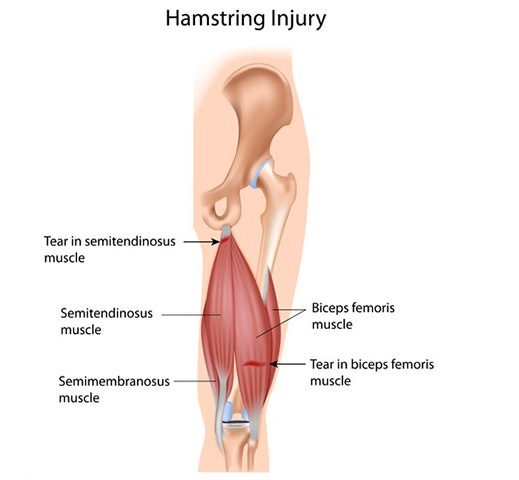 As a physiotherapist I find high hamstring strains one of the hardest injuries to rehabilitate. This is due to the tendon’s thickness, fibrousness and poor blood supply which slows its healing. In the sporting population, hamstring strains tend to be in the middle of the muscle and usually occur during maximal speed contraction e.g. sprinting. In dancers the pain is usually higher and closer to the tendon portion of the hamstring. They usually occur when stretching or at end of range e.g. grand battement devant. sylvie guillem, photgraphed by richard avedon. The hamstrings are a group of muscles that are comprised of three separate muscles located at the back of the thigh. The Biceps Femoris, Semitendinosus and the Semimembranosus. These muscles start at the ischial tuberosity (sit bone), extend down the back of the thigh and insert on either side of the knee. Because the hamstrings cross 2 joints (the knee and the hip), their functions are varied. The muscles function as movers and stabilisers of the hip and knee. The hamstrings are used to flex (bend) the knee and extend the hip. As dancers we often think about flexibility when it comes to hamstrings; splits, kicks, leg mounts, but how often do you think about hamstring strength? Strength in your hamstrings, especially at the end of range, can significantly decrease your risk of injuring them. Training your hamstrings at the end of range is important for dancers as this is where most injuries occur. Lying on your back with your foot in a theraband attached to the barre behind you. Starting with the leg at 90', lower your leg in parallel against the resistance of the band. Do this in parallel, turned out and turned in to ensure you bias all sides of the tendon. This exercise could also be done on a Pilates Cadillac, if you have access to one. Start standing in parallel, knees slightly bent and holding no more than 5kg dumbbells in each hand. Keeping your spine neutral, bend forward until you feel a gentle pull at the top of the hamstrings. Return to standing without changing your spine. Do this in parallel, turned out and turned in to ensure you strengthen all sides of the tendon. Making sure that your glutes are working correctly can also increase hamstring flexibility! If your glutes are lazy something else will have to take up their slack. If hamstrings are busy trying to do the glutes work they can’t do their own job. This makes hamstrings over worked, tight and resistant to being stretched. Don’t sit in long stretches when you are cold. The problem with doing this is that most of the stretch will be taken in the weakest part of the muscle. Don’t do long stretches and then start dancing. We now know that static stretching: that is holding any stretch for longer than 30 seconds, temporarily weakens muscles and reduces our body’s ability to create force. Remember that before classes we are looking to wake up our muscles and get them moving through the range we require during class. Save those long stretches for after classes when you are warm and are not requiring your muscles to work hard for you. As always, if you have any questions and particularly any niggles or pain in your hamstrings, talk to your dance health care professional to make sure you get the best treatment, rehabilitation and return to dance plan you can. Prevention is always better than cure!